This is a book like none other that I have come across. An exploration of the world of nature using coloured lenses to bring clarity to the pictures. I wish that I didn’t know about the science behind it, and for those who don’t, it will be a simply magical volume. Without doubt Carnovsky’s illustrations in three colours make this book the extraordinary volume it is. This is not a story book, this is a non fiction book showing animals and vegetation like never before. 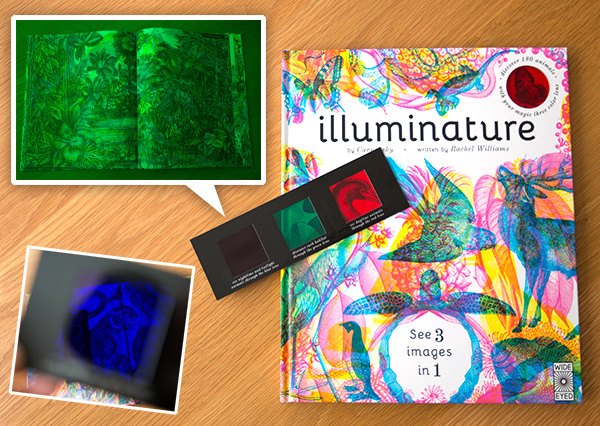 It is not only a beautifully illustrated book – it is full of information too. A wonderfully remarkable volume that should be given to all good little girls and boys who enjoy natural history. The lenses are set carefully into the inside of the front boards for safe keeping. It is beautiful and extraordinary.